It’s a well-known fact that the elements play a large role in the condition of our skin. In addition with keeping hydrated, eating a balanced diet and keeping stress levels as low as possible, there are fantastic products on the market intended to hydrate, protect and nourish it. 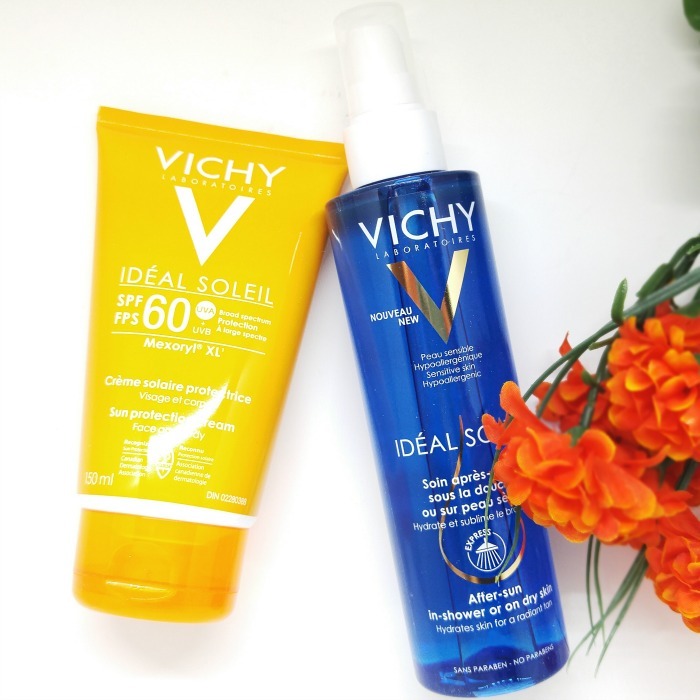 Treat summer skin with Vichy Normaderm and protect it with Vichy Ideal Soleil. 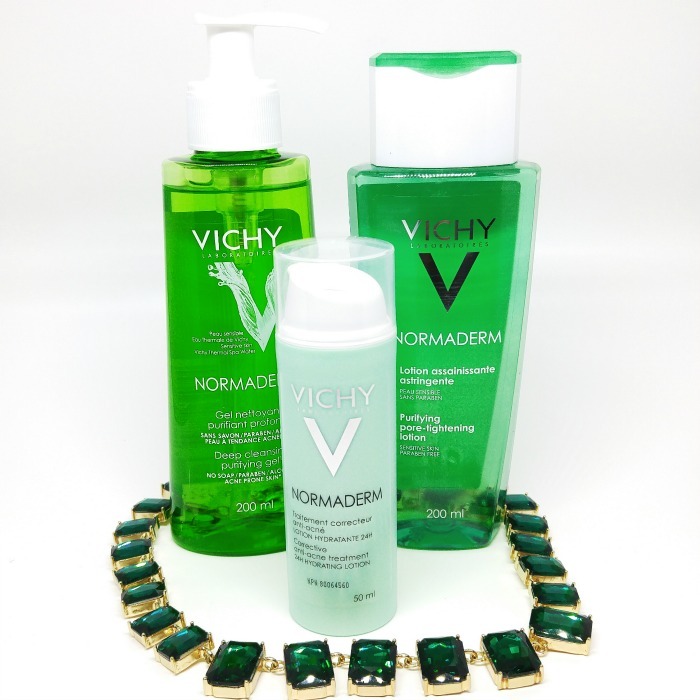 A few months ago I was sent the Vichy Normaderm line, for people with acne-prone skin. I for one initially thought, “well, I’m going to be kind of useless for this,” as I do not consider myself someone who has ever had trouble with acne. Well, as fate would have it, a few days later I got a few unsightly blemishes and got to take these products for a test drive. These three products/steps are to be applied in succession once during the day and once at night. The deep cleansing purifying gel is refreshing, with a pleasant scent. To me it kind of smells like greenery with some floral notes mixed in there. This product does not include soap, parabens or alcohol. It contains an association of “peeling effect” ingredients and a soothing agent. I massaged it into my face and then rinsed it off with water. After all three steps were applied is when I really noticed the peeling effect from this cleanser. It wasn’t in a bad sense (no one could see it) but I could my skin “pilling” for lack of a better word. Of course, afterwards it revealed bright, glowing skin beneath so it was all a process. Rather than what I typically think of when I hear the word “lotion” this felt more like a hybrid between a toning water and a gel. It is very rejuvenating and feels good on the skin and also contains “peeling effect” ingredients. I applied it using a cotton pad and made sure to avoid my eye area. It evaporated quickly once on my skin (no need to rinse off). After the toner dried I used the corrective treatment cream. This is when I really noticed, as mentioned before, the peeling effect of the other products. I did not apply makeup for the next few hours as that would have counter productive. 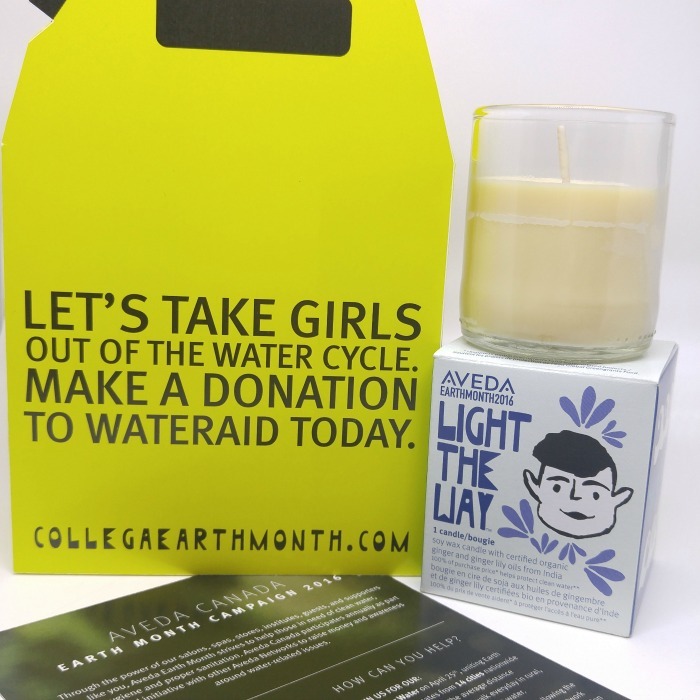 I loved the thought of the products gently removing the dead skin and impurities from my face. I did these three steps repeatedly for a few days and began to see a change in my blemishes. They began to diminish and dry. My skin was left glowing, hydrated and not irritated! These three products can be purchased in a kit from Vichy Canada for just under $70 CAD. It is suggested to apply it 15 minutes prior to sun exposure and then reapply once every two hours. The UV rating has been quite high for the past little while and it seems really typical of a Canadian summer. I am glad to be equipped with such a good quality product that also happens to be paraben free! This cream is also hypoallergenic and said to be fragrance free but I still feel like I do smell something when I apply it. It isn’t a bad scent, I just have a very keen sense of smell and cannot deny that I do smell something from it. Maybe it is just me and not everyone so I would suggest if you are set on fragrance-free, try it for yourself and see if it is what you are looking for. You can purchase this from Vichy Canada for approximately $30 CAD. So let’s just say you did use your sun protection but let a few rays slip in here and there before putting on some more of your SPF 60. Well then, you may have a bit of a glowing bronze tint to your skin! For that you can apply the After-sun product. You can either apply it directly to your dry skin, or while you are in the shower. If you are using it in the shower you are to wash with your soap, rinse off, apply the After-sun and then rinse that off as well. I did not use it in the shower but rather applied it to my dry skin. At first, I thought it would feel greasy but after a few minutes it was completely absorbed. The directions say nothing about rinsing it off if you apply it to your dry skin. So judging by the fact I could not longer feel any residue from it I did not rinse. After-sun can be purchased from Vichy Canada for approximately $30 CAD. Have you ever used Vichy Normaderm or Ideal Soleil products before? What are your favourite summer skin solution products?